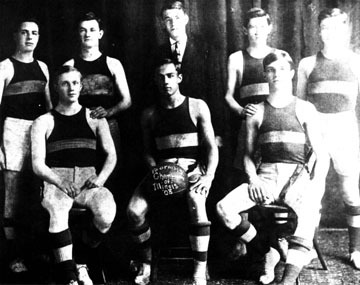 A true pioneer for high school basketball in Illinois was the outstanding 1907-08 Peoria High School team which won the first state tournament ever held in Illinois. The first state high school basketball tournament was an eight-team invitational affair at the Oak Park YMCA. Peoria High, coached by Les Straesser, a 1906 graduate of the school who also at the time was farming west of Peoria, had compiled a 14-1 regular season record. Included in the 14 wins was a 105-23 thumping of Streator at the old Peoria YMCA on Jefferson Street. Peoria led 65-5 at halftime and Wilbur "Bill" Forrest scored 32 field goals. The team's only loss was 43-23 at the hands of Spalding. At the first state tournament, Peoria turned back Wheaton, 41-26, then disposed of Hinsdale, 32-25, and won the state title by pounding Rock Island, 48-29. As a Pekin High School junior, Charlie was the 2005 Journal Star Girls Swimmer of the Year. She also earned that honor as a freshman. She topped the Journal Star's honor roll in all four freestyle distances and fell nine-hundredths of a second short of becoming a two-time all-American in the 200-yard freestyle. She finished 16th in the state meet in the 200 free and 24th in the 100 free.